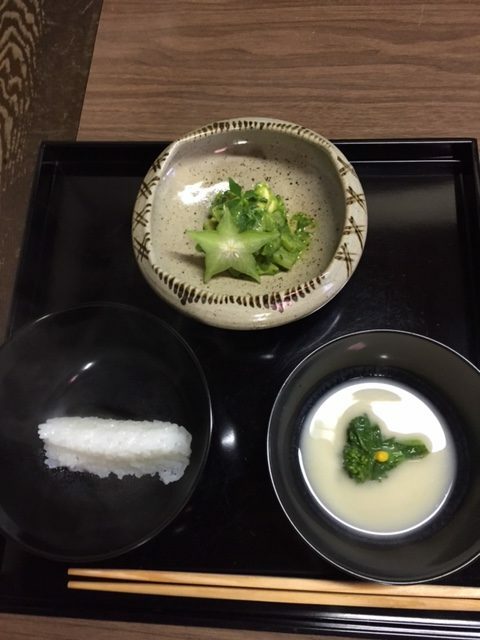 Mukozuke, literally “far side of the tray” course that is served with the first ichimonji rice (slightly wet) and the first miso soup, bamboo shoots, udo (mountain asparagus) mixed with paste of miso, kinome (Japanese pepper) leaves and spinach. Miso Shiro, the “miso soup” course, was brocollini boiled in vegetarian dashi on the day with a dash of yellow mustard to taste. Nimonowan, the “simmered dish” course, was green pea tofu, Kyoto carrot flower, a daikon slice to mimic ice and yuzu pine needles. Yakimono, the “grilled thing” course, was grilled momen tofu with white miso paste with ground yuzu on top and red miso paste. Kosuimono, the “chopsticks wash” course, was a kombu water infusion with aromatic ginger slices and peach petals. The hassun items were pan-fried arrowroot cut like pine cones and sea grapes wrapped in seaweed. Konomono, the “pickled thing” course, was takuan (daikon), radish, and a green thing. During the meal, guests are served rice four times (ichimonji, hanki with rice piles, hanki with the entirety of rice, and okoge “burnt rice in water”). They also receive the miso soup twice. The koicha tea sweet was steamed manju. Phew, I’m exhausted just reading that! All of the items were served on either lacquer or ceramic utensils. No glass is used this time of year, as it provides too cool of a feeling. We had to warm all the utensils prior to serving them to our guests. Everyone worked hard and did well at their individual tasks and we had no major screw-ups. We did accidently forget to bring the cooking charcoal, so we grilled the tofu on a pan instead. Luckily, tofu is fragile anyway so it most likely benefited from this treatment, though the guests didn’t get that delicious smokey flavor that comes from real charcoal. We had no fish because it was an entirely vegetarian menu, and that is usually the item that used the charcoal. After we cooked, we cleaned for a bit and then took a break and ate the delicious (and generous) mizuya meimai that our kohai had packed for us. Lots of goodies and snacks that we enjoyed. It was a long day for us, the chaji went long and we didn’t get home until 4:30 or so. But, we unpacked the dogu and let everything sit out to dry a bit better before repacking everything another day. All and all, I would say that it was a success. Our kohai took the time to tell us how delicious they found the food and how much they enjoyed Marian’s atmosphere and dogu. The comments and suggestions we received from all three sensei were both expected and appreciated. We made mistakes and it would be nice to do a second chaji to be able to work out all the hiccups. Like Gary-sensei was saying in lecture, the more often you do something the easier it gets. Timing is especially important as you don’t want to make your guests wait for food from the kitchen or serve the food too early and have it get cold. I imagine that these are common restaurant concerns but for the three of us it was all brand new experiences. I’m also including a few extra “non-chaji” related pictures. 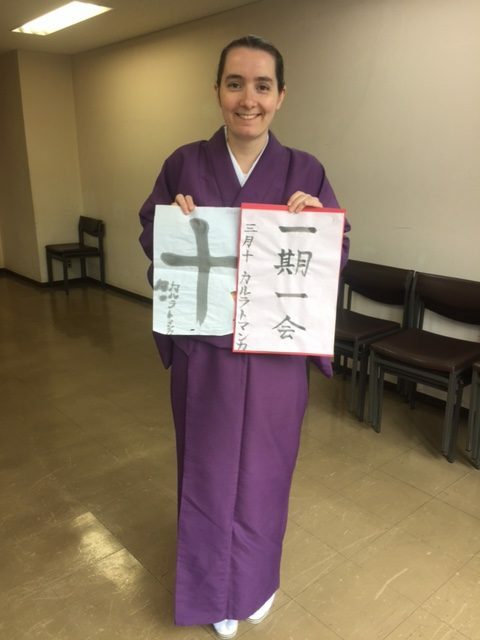 The first and last shodo assignments we had. We would do a “final” calligraphy and then put our name and date it. I would hope I don’t need to explain which one was from April 2016 and which one was from March 2017. 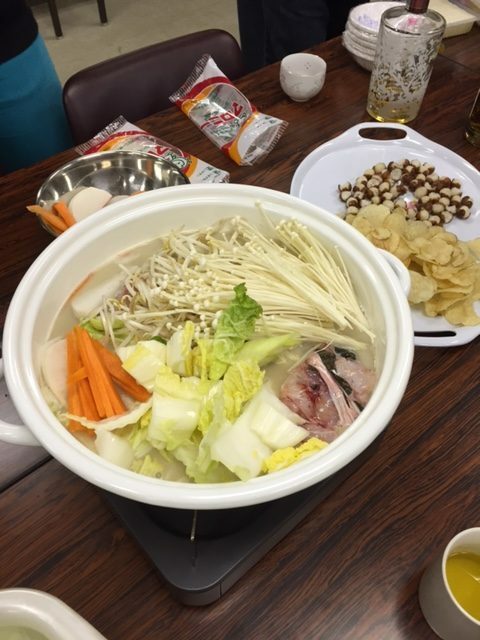 We also had a fun nabe party at the dorm that I thought people may be interested in seeing the ingredients that were included in the pot by the Japanese participants. The group picture is of my mizuya toban group for the second half of the year at our celebratory “we made it!” party. 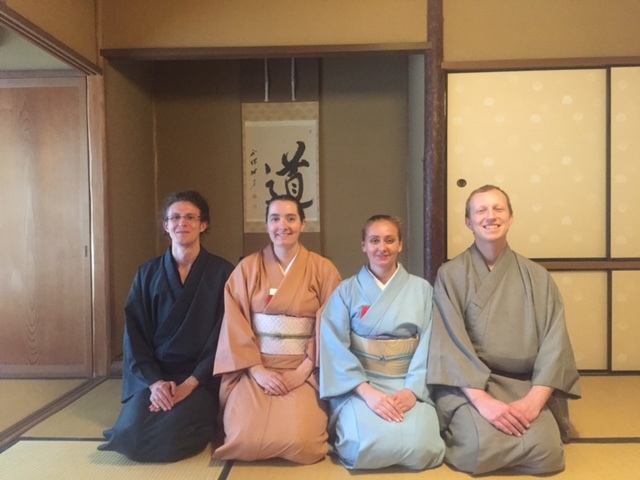 Also, a picture during our final jitsugi lesson with the four graduating sempai. From Left: Marian (Romania), me, Tetiana (Ukraine), Grzregorz (Poland).